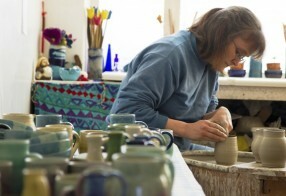 Jane Schaffer has been a professional potter since graduating from Medway College of Art and Design in 1989. Her pottery has been influenced by working at Ganla Stans Krukmakeri in Stockholm and a six month artist in residency in Shigaraki Japan. In 1998 she moved to York where she now produces a range of work that is both beautiful and functional. The following pages show examples of work and where it is available to buy.